Shanghai From an Original Sketch. Bridge across the Cauvery, at Trichinopoly. A pleasing view of Shanghai, China from the September 18, 1854 issue of The Illustrated London News. This view of Shanghai at the bottom of the page is drawn from an original sketch and depicts the Bund, a waterfront area in central Shanghai. The area centers on the section of Zhongshan Road within the former Shanghai International Settlement, which runs along the western bank of the Huangpu River, facing Pudong, in the eastern part of Huangpu District. Boats and fishermen are beautifully depicted in the forefront with the Bund in the Background. The Bund usually refers to the buildings and wharves on this section of the road, as well as some adjacent area. It is one of the most famous tourist destinations in Shanghai and building heights are restricted in this area. The Shanghai Bund has dozens of historical buildings, lining the Huangpu River, that once housed numerous banks and trading housing from the United Kingdom, France, United States, Italy, Russia, Germany, Japan, Netherlands and Belgium, as well as the consulates of Russia and Britain, a newspaper, the Shanghai Club and the Masonic Club. The Bund lies north of the old walled city of Shanghai. This was initially a British settlement. A building boom at the end of the 19th century and the beginning of the 20th century led to the Bund becoming a major financial hub of East Asia. The former French Bund, east of the walled city was formerly more a working harbor. 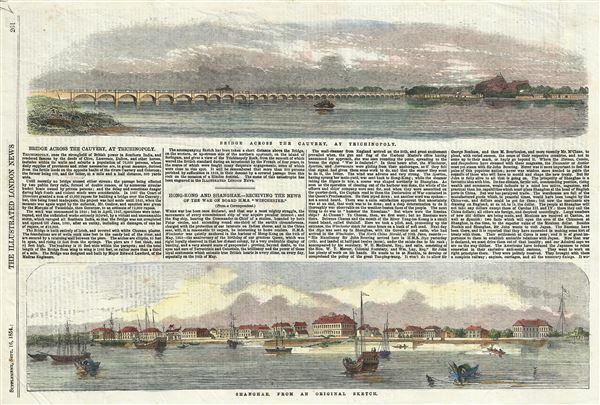 Another view in the top half of the page depicts the a bridge across the Cauvery (Kaveri) River, in Tiruchirapalli (Trichinopoly), Tamil Nadu in southern India. This view depicts the Cauvery Bridge as seen from the island of Srirangam. In the background, the Rock of Trichinopoly can be seen. Almost as interesting as the views , are the news facts and articles that accompany them. These views were published in the September 16, 1854 issue of The Illustrated London News. Illustrated London News (1842 - 1971) was one of the world's first weekly news magazines It was first published by Herbert Ingram and Mark Lemon (of Punch fame) in 1842. The lavishly illustrated magazine slowly gained popularity and continued to be published on a weekly basis until 1971. Today the Illustrated London News is the Illustrated London News Group and publishes bi-annually. The Illustrated London News, September 16, 1854.